Kills on contact. As fire ant mounds pop up in the yard, a light covering of Bengal is sprinkled on the mound. The killing action starts immediately as the ants come into contact with the dust. Over a period of hours, the dust is spread by the ants through the colony to the queen. 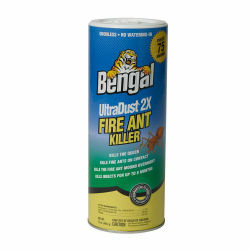 Kills the insects for up to 8 months. Faster acting than bait products. Does not clump or absorb moisture. Odorless. No application of water required easy-to-use shaker canister. It can also use on roses and ornamental plants. Great for Crazy Ants! Options: 12 oz. 24 oz.